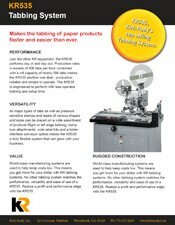 The KR535 Tabmaster mailing tabber makes mail piece tabbing faster and easier than ever. Just like other KR equipment, the KR535 performs day in and day out. Production rates in excess of 40k tabs per hour combined with a roll capacity of nearly 50k tabs makes the KR535 another real deal – productive, reliable and simple to operate. The KR535 is engineered to perform with less operator training and setup time. All major types of tabs as well as pressure sensitive stamps and labels of various shapes and sizes can be placed on a wide variety of products. 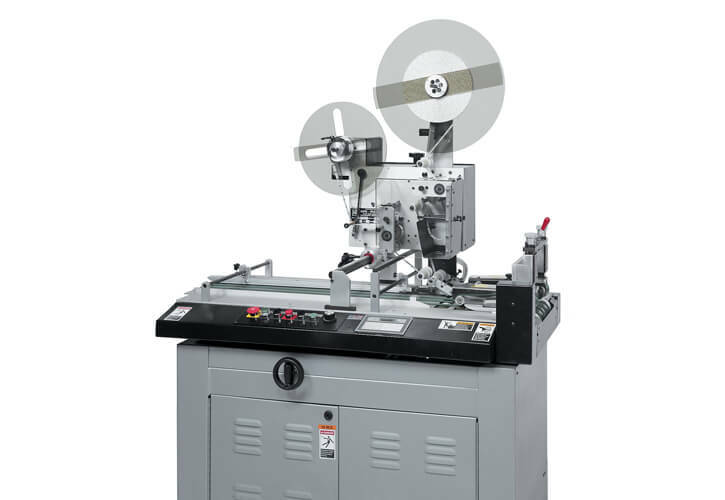 Right or left edge tabbing, bump turn attachments, wide and fan-folded label kits along with a folder interface conveyor option makes the KR535 a truly flexible system that can grow with your business. Roll form pressure sensitive magnets up to 3″ wide (6″ with optional wide magnet kit) are automatically peeled off the liner and applied to the mail piece. Registration gaps between magnets ensure accurate placement. PS magnets benefit advertisers and the consumer. Durable and long-lasting, advertiser’s can count on a message that stays in front of the consumer. End user’s like the convenience of useful telephone numbers that are readily available. Conversion kit # 540160-01 is required to run up to 3″ wide pressure sensitive magnets on the KR435, KR535 and KR535CS Tabbing Systems.